Back wall for the milking room. Dan used my Kikobian Books logo as the pattern. Oak floor boards for the hay loft! The floor boards for the hay loft aren't home milled, but they are locally milled. Dan's hand simply isn't ready for the chain saw, which is something he'd need to prepare more pine trees for milling floor boards. We considered waiting, but also really want the hay loft functional by the time we start harvesting hay. We didn't get a tax refund for federal taxes, but we got some back from the state; enough to buy the hay loft floor plus everything for a hayloft door. That is extremely encouraging! And the to-do list for barn completion is definitely getting shorter. We're currently getting about four or five chicken eggs every day, and every now and then we get an unusual egg. The other day Dan brought this one in from the chicken coop. And a couple days later he found a third. Since all three eggs are the same elongated shape, I can't help but wonder if they were laid by the same chicken. We'll never know! In other egg news, M.O.M. has been setting a clutch of duck eggs. My little preemie goatie girl is 4-weeks old now and thriving. However, we've developed a habit that I don't think I can break now! For her first several days she was bottle fed on my lap because she couldn't grasp a teat. After a few days I taught her how to nurse from her mother by laying her on my lap and showing her where the teat was. We did this several times a day until she caught on and could nurse on her own. Now she expects to nurse this way every morning. She follows her mother into the milking room and paws me to be put on my lap for breakfast! Once her tummy is full she wiggles down and stands for her morning scritches. Then I put her out with the other kids until the adults are done with their breakfasts. It's only in the morning that she expects this; the rest of the day she nurses normally from her mother. Initially she wanted to follow me instead of her mother, but she's gradually accepting that she's a goat instead of a human. But she still comes running when she sees me and will follow me around for as long as I'll let her. Developmentally, she's about two weeks old, although two extra weeks of milk has meant good weight gain. I'm just happy she's doing so well. Just need to mention that I'm having a problem with blogger since this morning. I can only sign into my dashboard. When I view my or anyone else's blog I'm signed out, so I can't comment. When I try to sign in I'm directed back to my dashboard. Hopefully I can get this corrected soon! While we're gradually collecting more plywood for the goat barn walls, there is still plenty to do on the inside. Like the hay feeder. The plans for this particular feeder came from Premier 1 Supply Company, although Dan made a few modifications. The specs are to accommodate standard-size sheep and goats, so we had to modify it for our mid-size Kinders. Also, we didn't order Premier's specially made feeder panel, rather, Dan cut down a sheep and goat stock panel from the local feed store.You can download the free plans here. The instructions offer a choice of single or double-sided feeders. I wanted the double-sided for several reasons. One is because it will be positioned under a hay chute. The other is because dominant goats have a tendency to hog any kind of feed and chase the others away. I figure you can't defend both sides of the feeder at the same time. The beauty of this design is that there is less wasted hay. The V-shape of the panels holds the hay, and the goats access it through the panel. The shelf on the bottom catches hay that gets pulled out and dropped. It's free-standing, so it could be moved in the future if we want. Directly above it will be a hay chute between two of the floor beams. It will be so nice to not have to wade through a crowd of grabby goats to fill the hay feeder. And that brings us to the hay loft floor. Originally Dan planned to mill it from our homegrown pine the way he has the rest of the barn. The problem is that it would require use of the chainsaw, but his hand just isn't ready for that yet. No matter, there's still plenty to do and it all has to be done before the goats can move in. Progress in any form is nice to see. 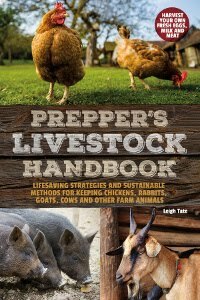 I am very pleased to share this book with you, Prepper's Dehydrator Handbook: Long-term food storage techniques for nutritions, delicious, lifesaving meals by Shelle Wells. It's the latest edition in the Ulysses Press prepper book series. I have an electric dehydrator, but admit I don't dry much. I think that's mostly because of my preservation and cooking habits, but a book like this inspires me to expand my repertoire of preservation methods. When I read through chapter 1, "Why Dehydrate," I was reminded why this is truly one of the best methods of preserving and storing foods. Dehydrated foods save on shelf and freezer space, have the longest shelf life, and are the most portable of all preserved foods. This chapter also includes really good ideas on developing a food storage plan with some helpful charts. 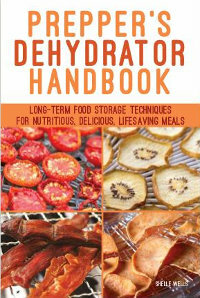 Chapter 2 discusses the various ways to dehydrate foods: solar, oven, microwave, and dehydrator, including a description of the different types of dehydrators. Chapter 3 offers basic instructions: equipment, general rules, both small and large batch drying, blanching (or not), how to prevent oxidation, conditioning after dehydrating, and rehydrating. Chapter 4 discusses finding and choosing foods to dehydrate (including frozen foods), as well as safety considerations such as what not to dehydrate and what foods are most commonly contaminated with E.coli, and how to safely prepare them. I appreciated the section on how light, heat, oxygen, and humidity effect dried foods, because I live in an area with hot humid summers! Chapter 5 gives you storage options for dehydrated goods, including tips on both short and long term storage. The next several chapters teach you the specifics for a variety of dried foods: fruit and vegetable leathers, jerkys, soups, powders, and herbs. Details on dehydrating 50 fruits and veggies are next, and then come the recipes. Things like blueberry basil syrup, pink grapefruit jelly, honey peach BBQ sauce, cinnamon apple leather, candied ginger, and how to make pickles from dehydrated cucumbers. Four conversion charts complete the excellent information in this handbook. 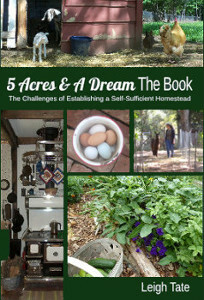 This is a great book for every food preservation and prepper's library. Click here to "Look Inside." Today was the original date I had circled on my goat calendar as Anna's due date. Today, Baby Miracle is 16 days old! How's she doing? Very well! She's bonded with her mother but comes running every time she sees me. Then she follows me around and bumps my legs looking for milk. She thinks her name is Baby, because I'm always asking Anna, "Where's your baby?" So there's a tale of woe with a happy ending. Gives meaning to the saying, "All's well that ends well."